Update: The charts and a little bit of the text in this article have been updated due to several models accidentally being left out of the initial charts. The overall story remains the same. Update #2: Based on Tesla’s fresh new shareholder letter (August 1), it seems that Tesla sold 13,000–14,000 Model 3s in July. It’s widely speculated that Tesla delayed US vehicle deliveries and shipped more cars abroad in the second quarter in order to not pass the 200,000 vehicle milestone that starts the US federal EV tax credit phaseout. Indeed, as Tesla told us recently, the 200,000 vehicle milestone was passed in July, not June. With that critical marker crossed and Tesla Model 3 production ramping up in the meantime, it seems appropriate to return to a comparison of Model 3 sales versus sales of competitors in its class. Last we heard from Tesla, the Model 3 had just become the top-selling small or midsize luxury car in the USA. Using data from GoodCarBadCar and hints regarding Tesla Model 3 production, I came up with the data above and below — estimates for July. For the non-Tesla vehicles, I increased June sales by 5% to account for the extra day in the month and potentially higher sales. For Tesla, I think the 16,000 vehicle estimate is a bit conservative, but I’m more or less expecting that to be the figure in July. 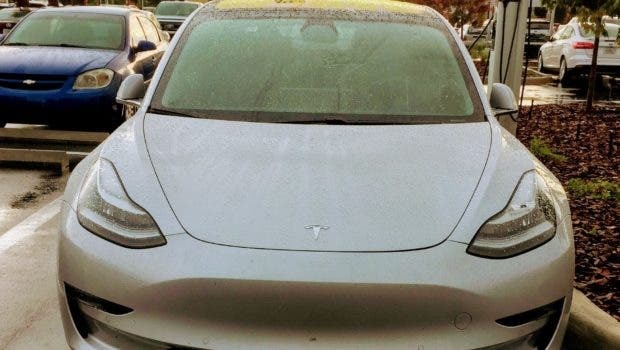 There were over 11,000 Tesla Model 3s in transit at the end of June, and it’s widely presumed that many of those were being held till July just so that Tesla wouldn’t cross that 200,000 vehicle milestone noted above until Q3. That’s a fairly high number, but with a production ramp at the end of July, production and deliveries may line up quite well anyway. As you can see in the first chart above, the Model 3 wallops the competition. The rest of the small & midsize luxury cars look like bit players, almost insignificant as you stroll down the list a bit. I do actually think the comparison is a little unfair, since the other automakers often have more than one model in the small and midsize luxury car market whereas you only have one choice if you want a Tesla that isn’t a landboat. So, to make the comparison a bit more legit, I created a second chart that combines the sales of multiple models in the small and midsize luxury car classes. Have a look. Looking at these numbers and charts made me think, “This is why the shorts are freaking out.” For one, once these comparisons start getting out into the mainstream media, the whole narrative around Tesla could shift. The media could transition back to glowing pieces about the wonders of Tesla and the genius of Elon Musk (instead of the tabloid-like nonsense and misleading financial hit pieces we’ve been seeing). In any case, it’s going to get clear very soon that there’s a disruptor in town. What happens if this disruption gets out of control? What happens when the media catches on? What happens when the public catches on? What happens when more players in the financial markets catch on? The shorts will lose a lot of money, and Big Oil and Big Auto will be in for a rocky ride. Stay tuned to CleanTechnica for more fun along the way, and become a member, supporter, or ambassador to help us create original content like this. Tesla Production Rising Toward 7,000 Vehicles A Week?